Often known as the Sheltie, the Shetland Collie, the Peerie, and the Dwarf Scotch Shepherd, the Shetland Sheepdog is a small version of a rough coated, working collie. Bred to help control herds of cattle and flocks of sheep, this breed is generally kind, obedient, and willing. 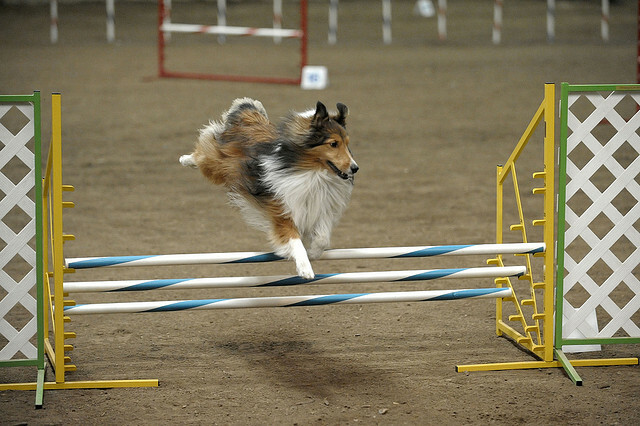 Shetland Sheepdogs excel in the show ring, as well as in agility and obedience competitions. Best known for their affectionate disposition and beautiful appearance, many people find these dogs to be a beloved family companion. 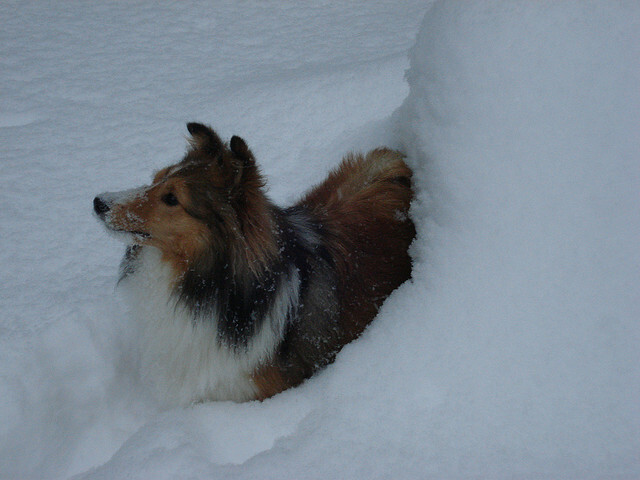 Shelties were developed on the Shetland Islands, islands located north of Scotland’s mainland. The Shetland Islands are known for producing many dwarf animals, such as dwarf Shetland cattle, small Shetland sheep, and the Shetland pony. 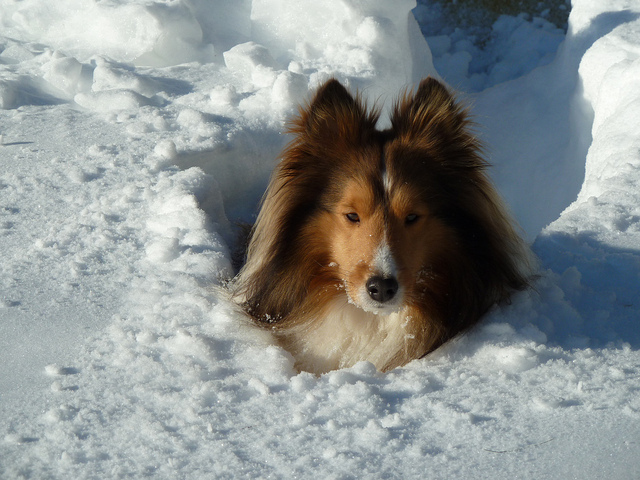 Since the Shetland islands have little vegetation and feature a rocky, rugged terrain, it’s easy to see why the Shetland Sheepdog is so small. During the 1700s, it was common for fishing boats to visit the Shetland Islands, bringing many different breeds of dogs to the islands. A few of the breeds brought to the islands include working sheepdogs from Scotland’s mainland, King Charles Spaniels, Scandinavian spitz-type dogs, and Greenland’s Yakki dogs. These dogs cross bred with dogs native to the islands, which eventually resulting in the beautiful Shetland Sheepdog breed that we have today. It wasn’t until the 19th century that the breed gained interest as a companion dog. British sailors often visited the Shetland Islands, and some purchased these dwarf dogs to take home to their children. The Shetland Islands finally founded the Shetland Sheepdog Club in 1908. England’s Kennel Club eventually recognized the breed as the Shetland Collie in 1909. 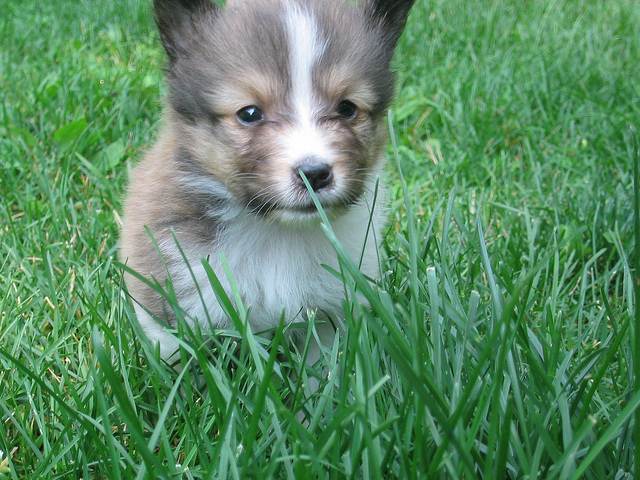 Later, in 1911, the first Shetland Sheepdog was registered by the American Kennel Club. The Shetland Sheepdog looks much like the collie, featuring a thick, beautiful coat, an agile body, and a wedge-shaped, distinctive head. 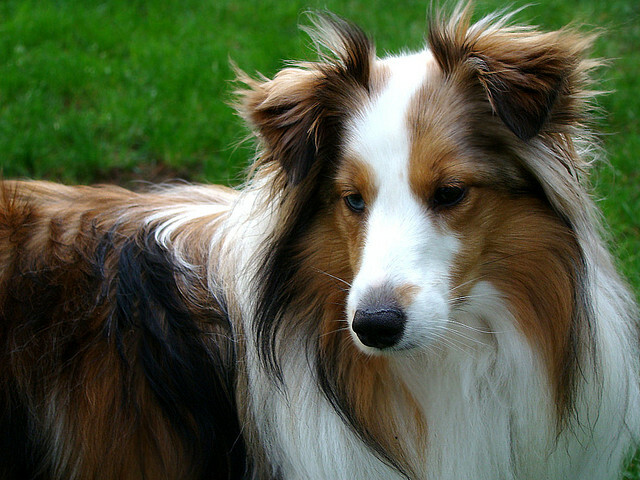 Shelties have a well-rounded, narrow muzzle, a black nose, and almond shaped, gentle, dark eyes. The ears are set high on the heat, they’re small, and generally they are carried erect. The breed’s long tail should reach back to the hock and the dogs should have a muscular, yet not heavy, body. Shetland Sheepdogs have a thick double coat that includes a thick, short undercoat that pushes the harsh topcoat away from their body. The ears, feet, and head are adorned with smooth hair, and the mane and frill are covered with abundant, extra-thick hair. These dogs may have coats that are black, blue merle, and sable, which can range from gold to mahogany. 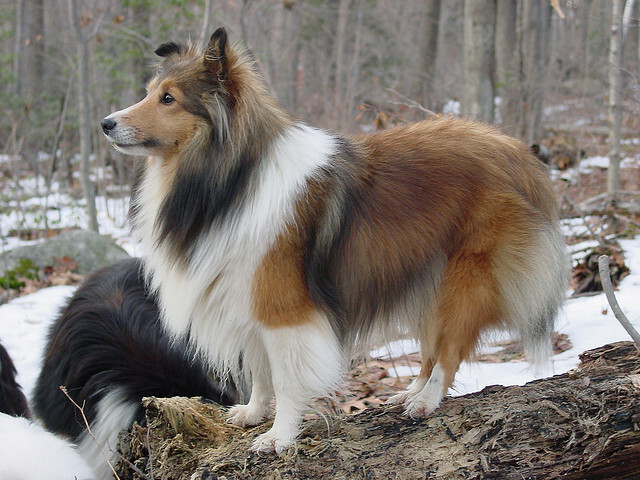 In some cases, a Shetland Sheepdog may be more than 50% white and some brindle dogs exist. While these two colorings disqualify them from the show ring, they still make wonderful family dogs. 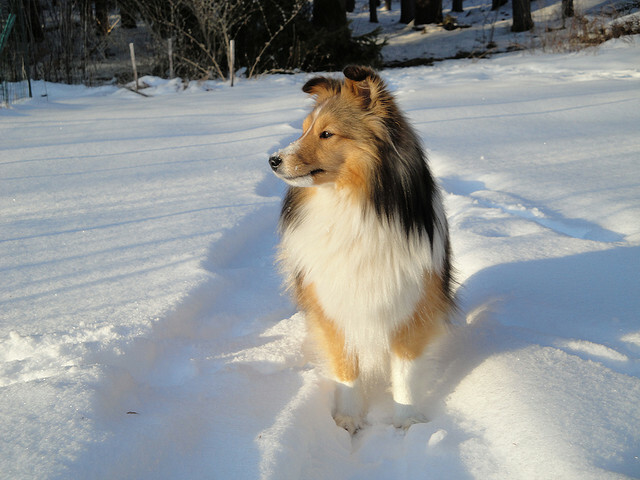 Regardless of gender, a mature Shetland Sheepdog should be between 13-16 inches tall at the shoulder. 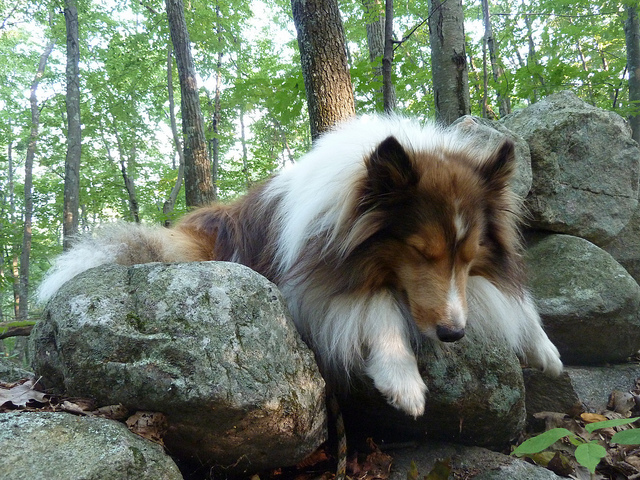 A properly sized Sheltie usually weighs around 18 pounds. 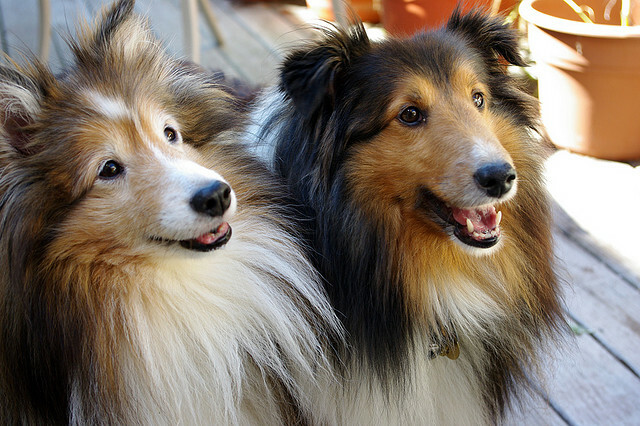 Shelties are wonderful family dogs, and they love being with the family. They want to be a part of both indoor and outdoor activities and they get along very well with children. 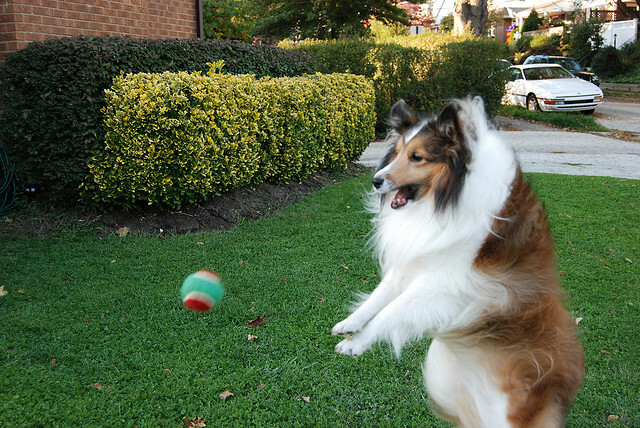 The high intelligence of the Shetland Sheepdog makes the breed pick up training quickly. These dogs pick up commands very quickly and they have a strong desire to please their owner. During training sessions, you’ll only need treats and praise to keep them motivated. Harsh treatment should never be used on these dogs or they may become defensive. Shetland Sheepdogs love to be the center of attention, and showmanship comes naturally. A great way to keep these dogs mentally sharp is use trick training. Since the Shetland Sheepdog has an ear-piercing, high pitched bark, it’s important to teach the Sheltie to quiet down on command. It’s also essential to socialize these dogs to ensure that they alert you to the approach of a stranger without barking at every person or animal that walks by. While these dogs are small enough for apartment living, they require plenty of exercise. They’ll need daily walks and plenty of time to run. Since the breed is so smart, it’s a good idea to enroll these dogs in organized herding, agility, trick training, or advanced obedience activities. This allows them to use their minds and bodies, which will keep the dogs calm. Bored Shelties may bark excessively, so it’s important to ensure these dogs get plenty of physical and mental activity each day. Since the Shetland Sheepdog has such a long coat, it’s important to brush the coat at least once weekly using a pin brush. This helps to undo tangles and remove loose hair, preventing matting. When brushing Shetland Sheepdogs, it’s essential to get all the way to the skin. Before brushing, wet the hair with a spray bottle to avoid damaging the hair. The hair under the legs and behind the ears requires special care. When Shelties are shedding, daily brushing will be needed. Females generally blow their coat twice yearly, while males only blow their coat once each year. Since the coat is naturally water and dirt resistant, you’ll only need to bath these dogs as needed. The ears of a Shetland Sheepdog should be checked each week for signs of wax buildup, irritation, or infection. It’s also important to cleanse the ears regularly using a cleaner that’s been approved by your veterinarian. The Shetland Sheepdog’s teeth should be brushed once each week. If the dog doesn’t wear down the toenails naturally, nails need to be trimmed monthly. Shetland Sheepdogs have been used to herd cattle and control flocks of sheep, many of these dogs continue to participate in sheepdog trials. This breed works to conduct livestock from one area to another using flight behavior and fear-flocking. Due to their breeding, the breed has an instinct to herd. 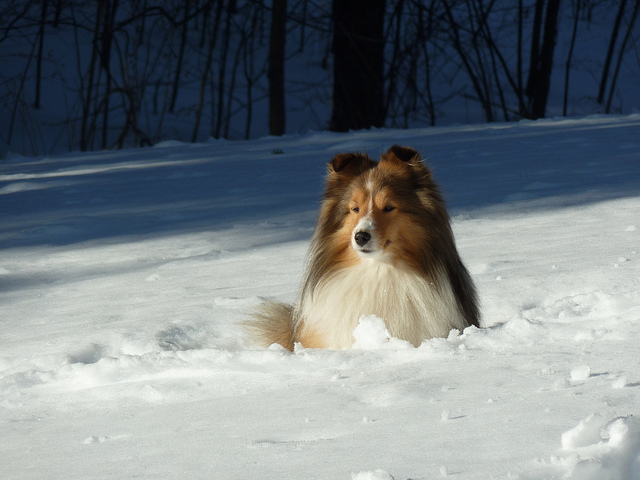 Shelties that show basic herding instincts are often trained to take part in herding trials. The Shetland Sheepdog also dominates obedience, tracking, dog agility, showmanship, and flyball in its size group.